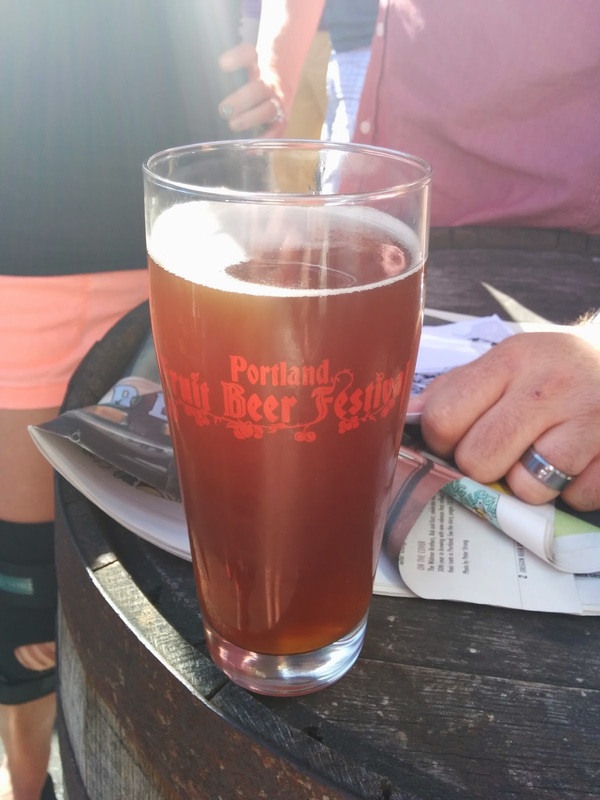 Saturday I went to the 2014 Portland Fruit Beer Festival at Burnside Brewing. 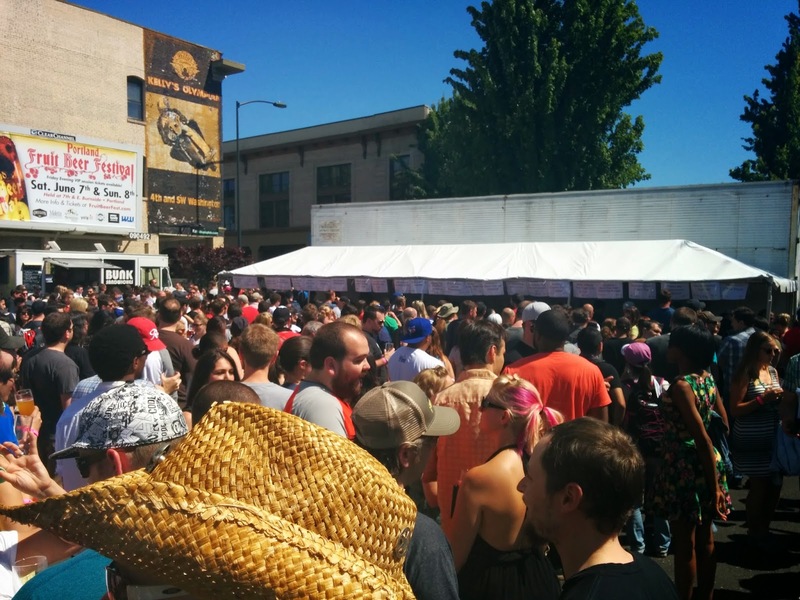 It was a very warm day and the festival being in on the blacktop of the Burnside parking lot did not help. The festival was opened up for an additional day on Friday in order to reduce the crowding. I didn't go last year so I have nothing to compare it to but I think it may have gotten popular enough for a larger venue. In spite of the minor crowding and the hot weather the festival was a great time. Lines were a little long but some of that may just have been trying to figure out where the end of the line was. Once I discovered that most people were just hanging out under the tent to stay cool, the lines went much faster. The glasses were awesome! I didn't measure, but they seemed to be larger than the traditional plastic beer fest cup that I have come to expect for festivals. It is always much nicer to drink out of glass than a plastic mug. There was also a Rare & Rotating Fruit Beer list where you could get a glass or sample the beers that the breweries deemed a little more valuable than the standard one ticket. Most beers here were going for 2-3 tickets for a taster. The line was very long so I didn't try any of them although these were some of the most interesting sounding beers. I only got to try a few beers but for the most part they were pretty good. Featuring juice from the USDA definition of Fruit Cocktail 40% Peaches, 35% Pears 10% Pineapple , 10% grapes and 5% Cherries. A hazy golden ale with lively carbonation the fruit flavor comes through but its very complex no one fruit really stands out. Malt smoked in peach wood gives this beer its smoke character. I found this aroma to be very smokey and not too much of the marionberry came through. I would have probably liked it a little more if the concentrations were reversed. The flavor had a little more berry but still very smokey. Vintage barrels of Flanders Red-style beer aged in Pinot barrels with strawberries and plums that were inoculated with Brett and Lacto. Aged on strawberry puree and a balsamic vinegar reduction. A hazy amber beer with strong strawberry aroma and flavor. Moderately sour with a slight funk Superb beer probably my favorite. Light bitterness and mango fruitiness bittered with Centennial an finished with Citra and Mosaic Hops. Four lbs of pureed mango were added to each barrel in the fermenter. Moderate mango aroma nice flavor, nothing really stood out as amazing about this beer but it was definitely enjoyable. Reverend Nats's Hard Cider - Portland, OR - ¡Sweet Triple Hot Tepache! Partially fermented pineapples with Habanero, Aji and Ghost chilies all went into this beer. A cloudy golden ale with a strong pineapple aroma after a few breaths a aroma almost like that of bacon came to me. The taste was sweet with a little residual spice. Smooth, golden beer brewed with milk sugar (lactose) and peaches. Some nice peach aromatics came off this beer and the lactose gave it a little residual sweetness. The peach aroma in the flavor had more of the peach pit flavor to me, still refreshing and pleasant to drink. 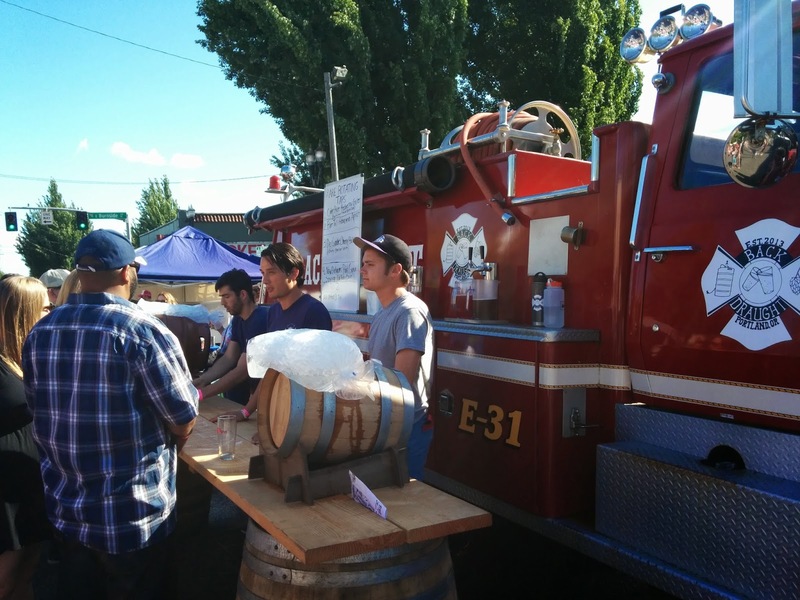 When we were fruit beer'd out we walked over to Ash Street Saloon for a Thunder Carriage show. While crossing the Burnside bridge came across what I can only think is the nomads version of a missed connections column. 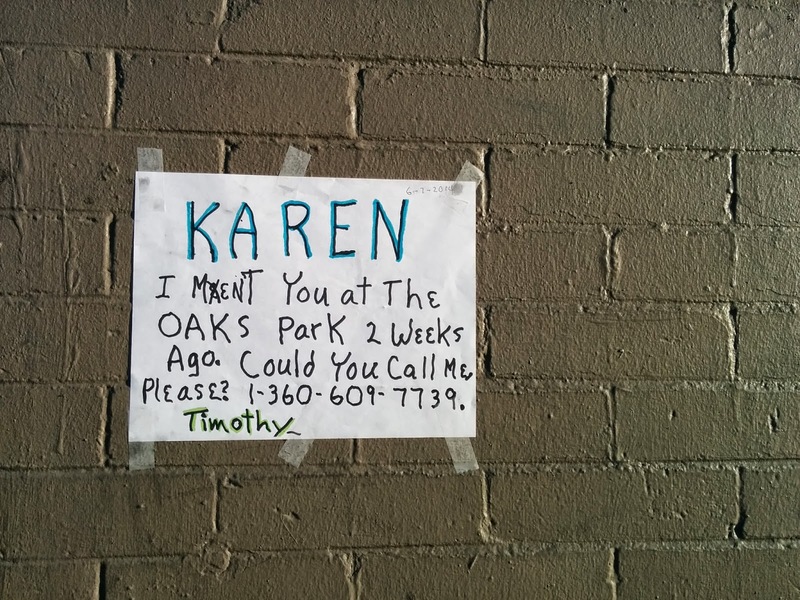 Karen, if you are out there, please call Timothy. His felt tip markers long for your sweet embrace.